During January, from the 13th through the 16th, we had morning low temperatures from 14 to 18F. The palm trees, and some other kinds, are looking pretty bad now with obvious damage. The palms looked like this after the February 2011 cold spell but revived when the summer rains arrived. Hopefully that will be the case this year also. Yesterday's frontal passage produced cold winds (30 to 40 mph - Guthrie RAWS came in with 53 mph) and periods of light showers. The ALERT network shows mostly light amounts for the past 24-hours over both the west (above) metro area and also to the east (below). 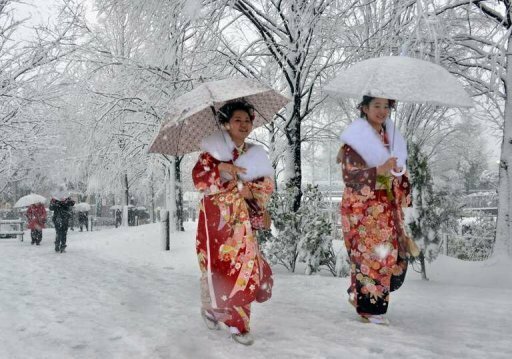 There were only four reports of a quater of an inch or more. 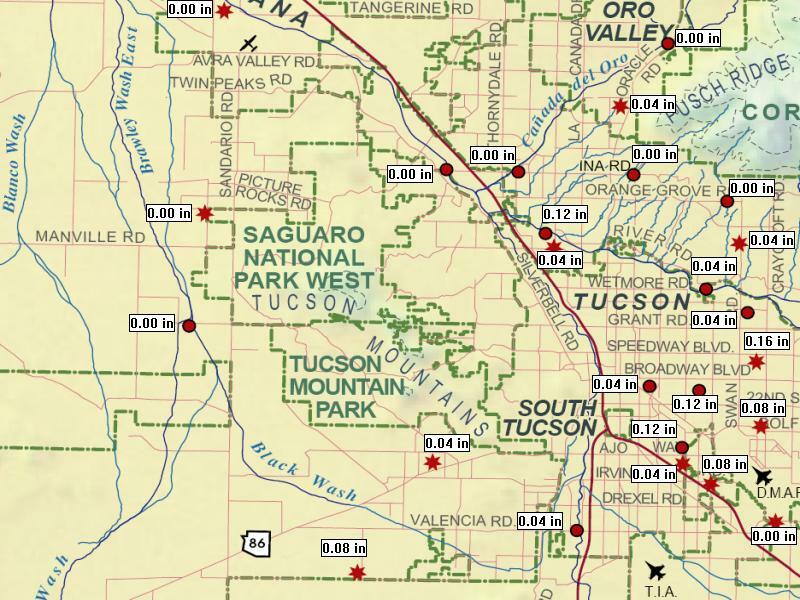 About 60% of the ALERT stations had measurable rainfall. However, this is a bit misleading since some stations, e.g., Manning Camp, had only snowfall, which is not measured. Here at the house there was 0.05" in the gauge this morning, with a morning low of 35F. 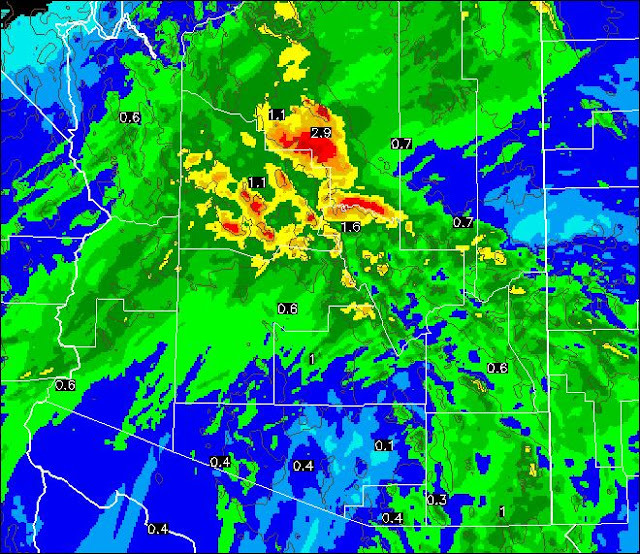 Atmo also had 0.05", while TUS had 0.06" and DM AFB had 0.03". Bottom image shows some snow cover at Bisbee this morning. Severe thunderstorms early this winter morning are occurring over the southern Plains. 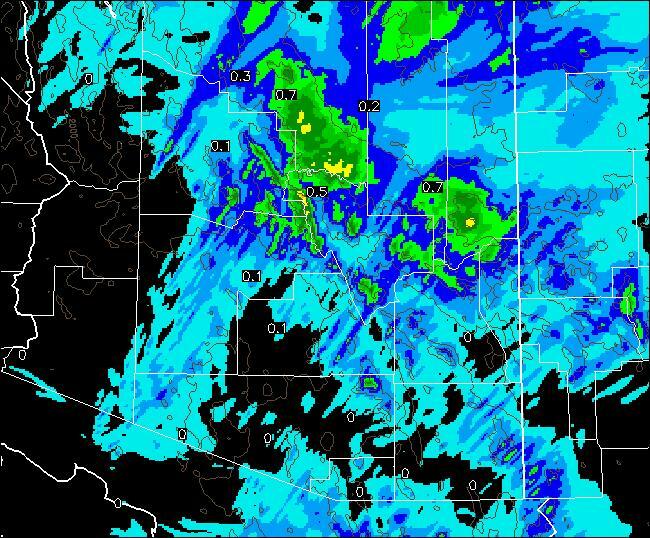 Above is base scan from NWS Tulsa radar a bit after 7 am (29 January 2013). There are currently two tornado watches out from southwestern Oklahoma into southwestern Missouri. There is a moderate risk area for later today, centered over Arknasas. A major winter storm is expected as an intense low develops toward the western Great Lakes region. We have had a number of light showers here at house this early afternoon (Monday January 28th) with gusty winds of 20 to 30 mph. The temperature has fallen to 46F, so it is quite raw out. The very low rainbow above was along the foothills of the Catalinas at a bit after 2 pm MST, while the snow was flying up on Mt. Lemmon (below) a bit before 3 pm. 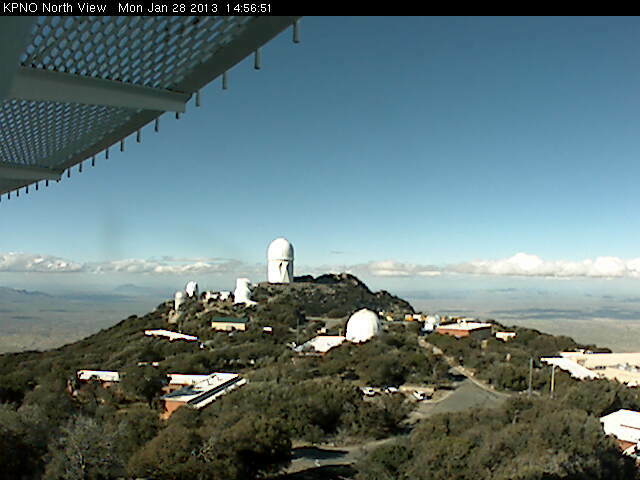 At the same time skies were sunny out at Kitt Peak (bottom). 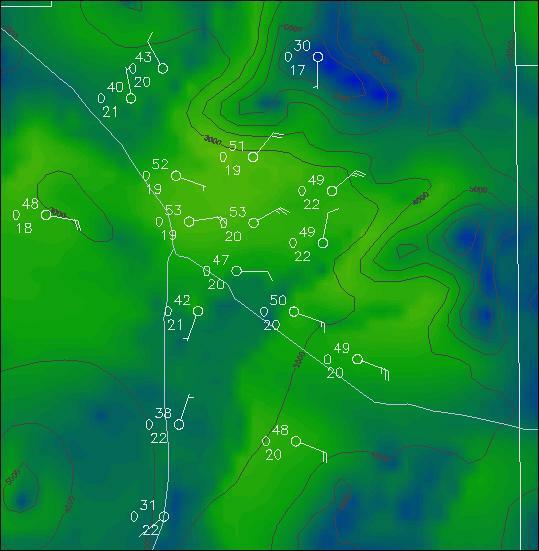 The current surface plot (above from NCAR RAL) for a bit after 6 am MST shows that the approaching cold front is about half way across Arizona. Precipitation is mostly confined to northern parts of the state. 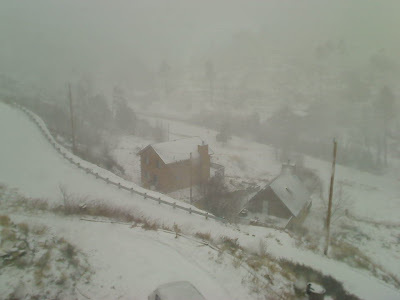 Snow has returned to Flagstaff and the Grand Canyon area after the heavy rains of the weekend. Gusty winds behind the front for much of the state today. 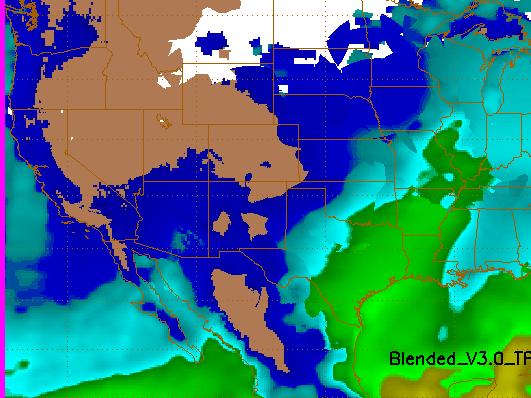 The blended PW product from CIRA at Colorado State is shown above for 5 am MST this morning. 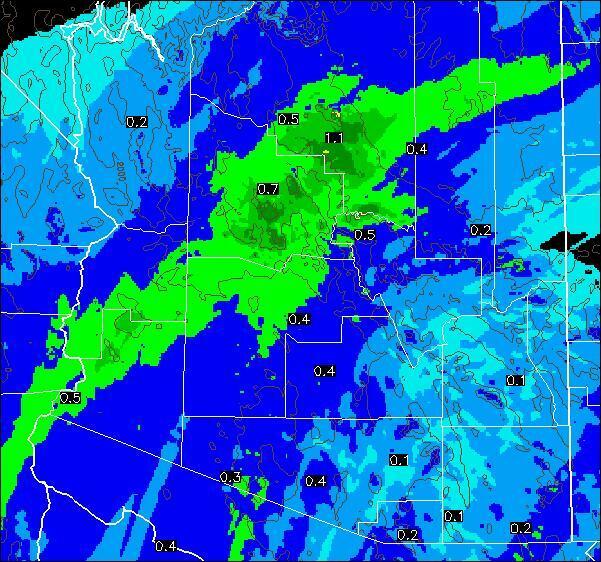 This analysis indicates that the current system is fairly starved for moisture, with amounts of 0.50 inch just into southeast Arizona (the light blue indicates amounts over half an inch). Much different than Saturday's system which had significant moisture inflow from low latitudes. coarse grid GFS smoothing mountain precipitation into lower elevations. So it looks windy and cooler, with some light showers about. Some spots in the lower elevations may get enough rain to wet the roads while other places will get spits and sprinkles, as more significant amounts stay at higher elevations. In the longer range, some GFS members are predicting a system at 8-9 days that taps into low latitude moisture - but of course, that's off in February. 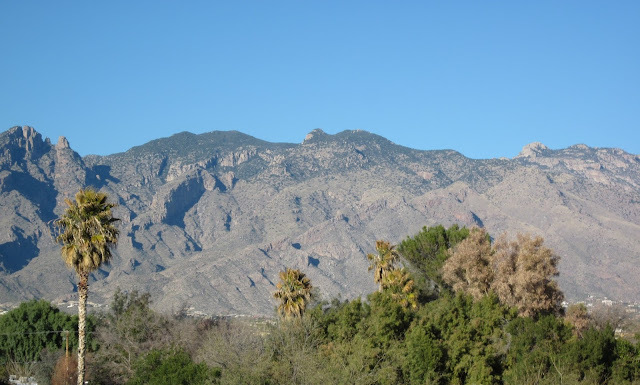 Yesterday's rain event had ended here at the house by noon, but there were isolated showers around during the afternoon and evening, especially out to the northwest and also east of Tucson. 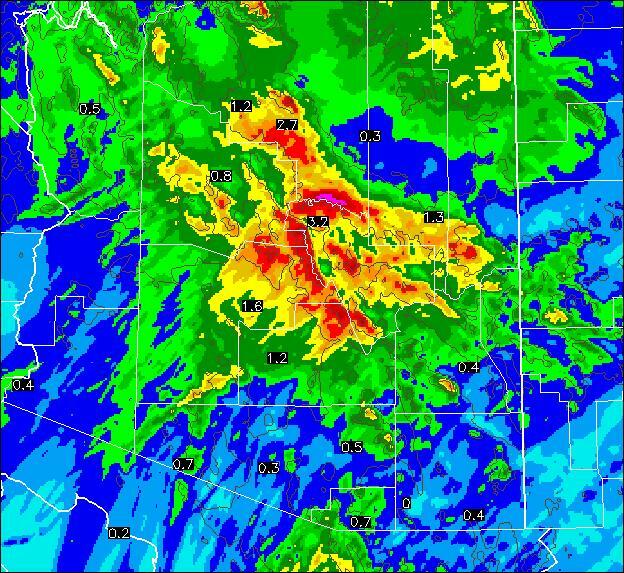 The Atmo WRF-GFS predicted the pattern of the rainfall across southeast Arizona well, although the amounts were somewhat under-forecast. Rainfall here at the house ended up at 0.59". With amounts over an inch in the Catalinas, the Rillito Wash was flowing yesterday afternoon - the first time in quite a long while. 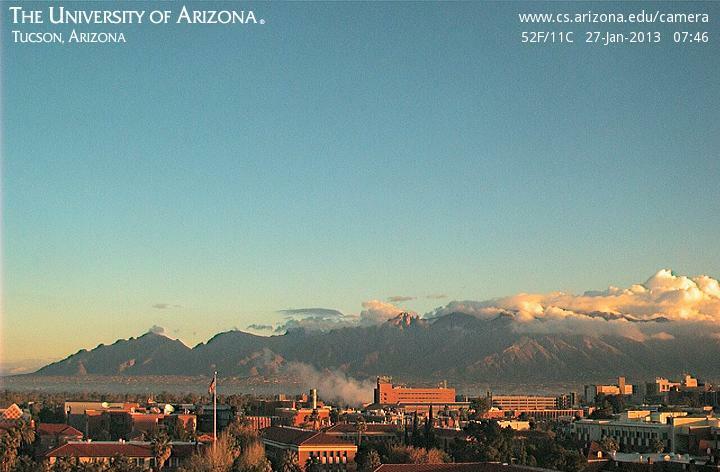 Morning view of Catalinas from campus (top) and just below shot from Mt. 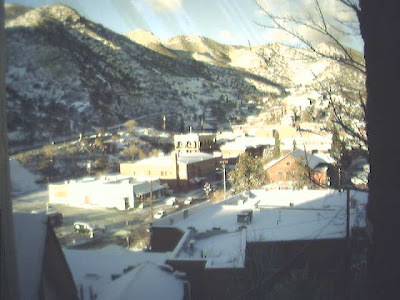 Lemmon showing the snow mostly gone after the rain. 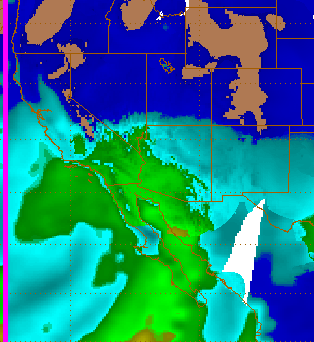 The next system will move in tomorrow with a strong and cold 500 mb short wave sweeping across Arizona. The early run of the WRF-GFS moves the cold front by before noon and has showers affecting mostly the high elevations areas of southeast Arizona. 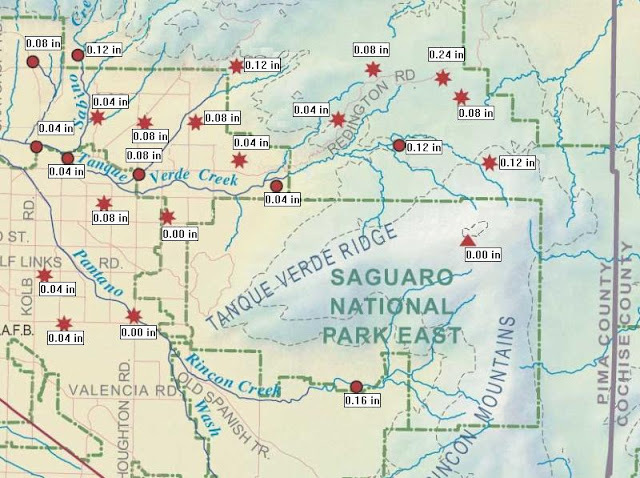 The forecast above is on the 5.4 km domain (total precipitation valid at midnight tomorrow night) and indicates the focus again on the Rim country. David Blanchard reported the heavy rains yesterday at Flagstaff were eating away the snow cover up there - next system should replace some of it. The high-resolution forecast of total precipitation on the 1.8 km grid (below, also valid at midnight Monday night) indicates very light amounts at some some lower-elevation spots in Pima County - all-in-all the WRF forecasts a rather wimpy precipitation event here in the southeast part of state. Very substantial plume of tropical/subtropical moisture extends into much of Arizona and southern California this morning. Above is 12 UTC blended PW product from CIRA/Colorado State and below is 10 UTC MIMIC PW product from CIMSS at Univ. of Wisconsin. The MIMIC product shows the moisture plume extending northward to the central California coast, where it is interacting with a narrow atmospheric river coming from north of Hawaii. Rain amounts already are at 0.50 to 0.75 inches in the mountains, with amounts reaching to around 0.33" at some places in the metro area. 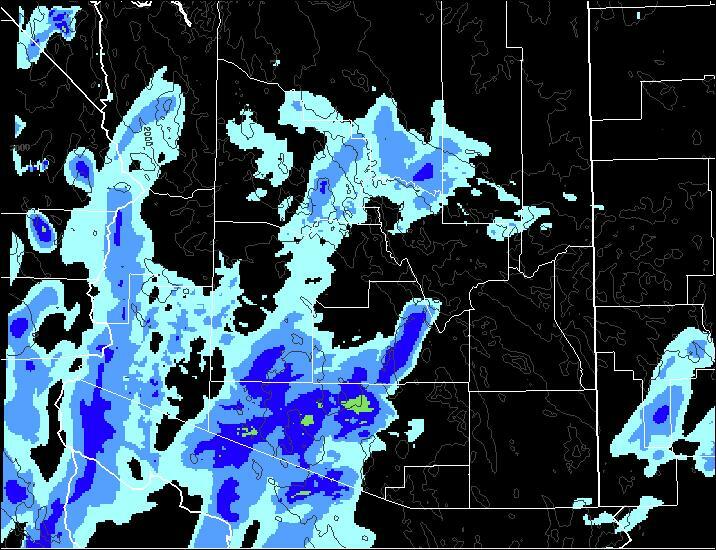 The early WRF-GFS forecast of precipitation through midnight tomorrow night (27 January 2013) is shown above - with a major event indicated for the higher elevations of northern Arizona with a focus on the Rim north of Payson. The latest NAM forecast of precipitation ending at same time is below. It appears that both models continue to under-forecast rainfall amounts for our part of the state (we are now around 0.35" here at the house). 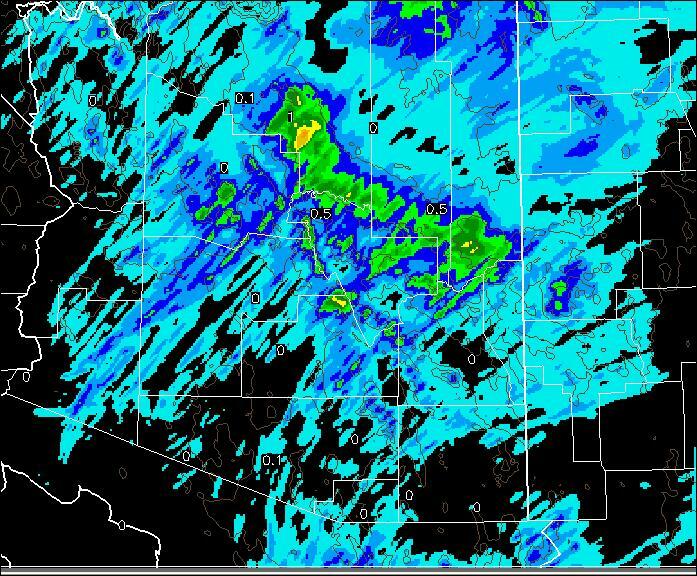 The early run of Atmo's 1.8 km grid WRF-GFS model forecasts several bands of showers to move across eastern Pima County, especially tonight and early tomorrow morning. Above is model's forecast of composite radar echoes valid at 5 am on Saturday January 26th. Below is the forecast (on the 5.4 km grid) of accumulated precipitation through 2 am on the 28th. 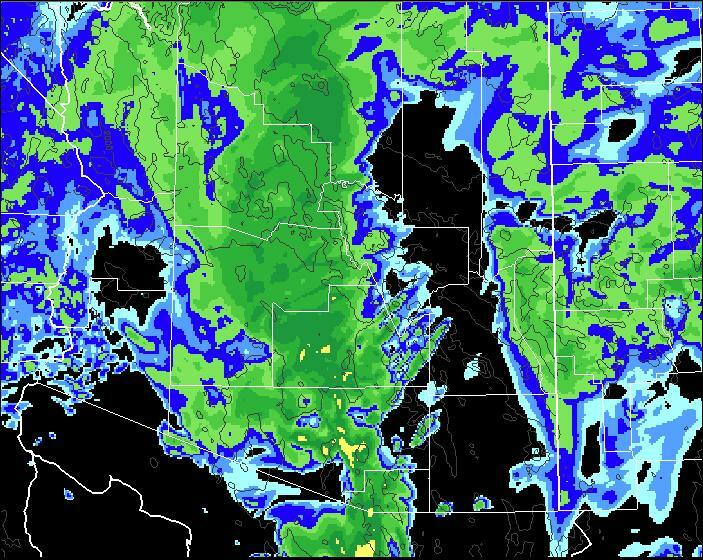 The model has a distinct minimum of precipitation across south-central Arizona, while forecasting large amounts of precipitation in the Rim country. Zooming in on the 1.8 km grid, the model forecasts widespread, but light, precipitation across all of southern Arizona through 6 am Saturday morning (above). However, the model forecasts a shift of the activity to the north and east after tomorrow morning. 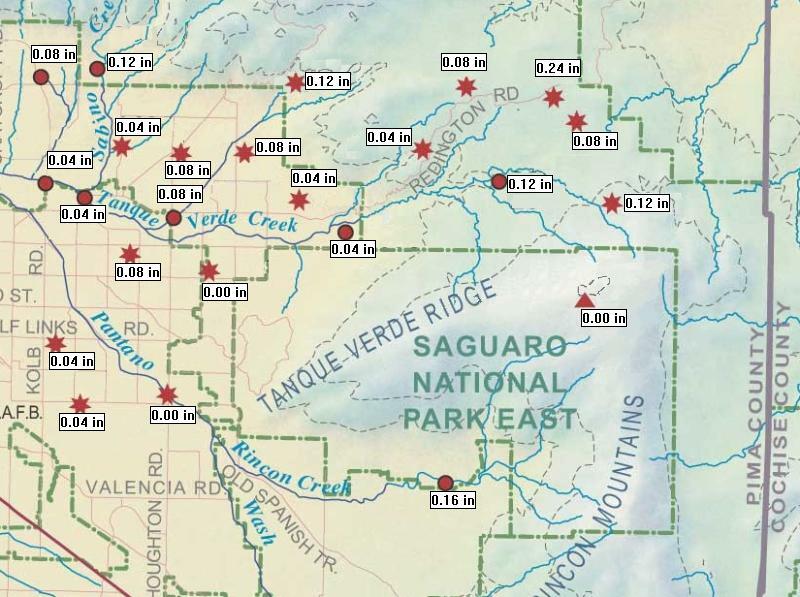 Below is the total precipitation forecast thought 2 am on the 28th, indicating little additional precipitation in much of Pima County, except at higher elevations. The larger-scale, long-term models have been very erratic with this event, so confidence is not high in the GFS conditions provided to the WRF - will have to watch how this all evolves. Light rain falling here at the house. 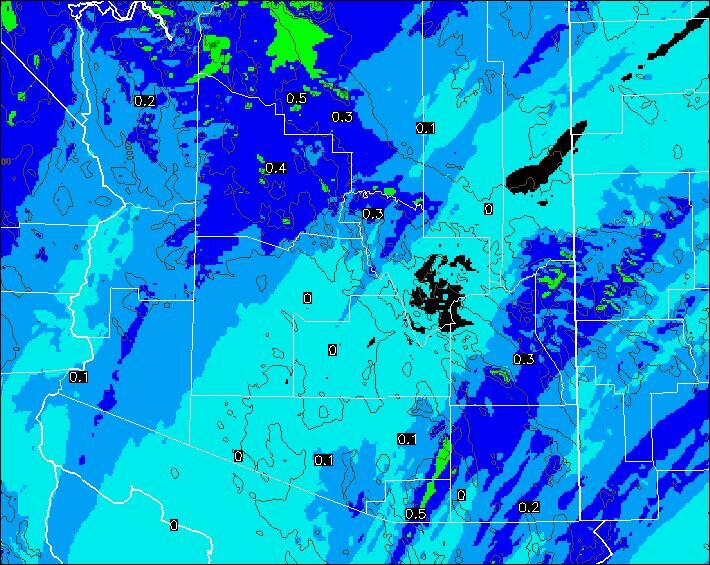 The Tucson NWS radar composite image above shows widespread echoes across Pima County at the current time. View of Catalinas below shows light rain across northern portions of Tucson and the mountains. There is 0.01" in the gauge here already! Edited to add update at 5 pm MST - about 35% of the Pima County ALERT stations measured light rainfall today. Total here at house was 0.06". With thick cloud cover, the temperature remained quite mild during the night - low here at house appears to have been a relatively balmy 50F. Above is water vapor image for 13 UTC this morning (24 January 2013). The upper-level system off the west coast appears to be more complex than indicated in the model forecasts. There appear to be two distinct vorticity maxima interacting this morning - one is about due west of San Diego and the other (with the dry center, is to its west-northwest and digging southward. 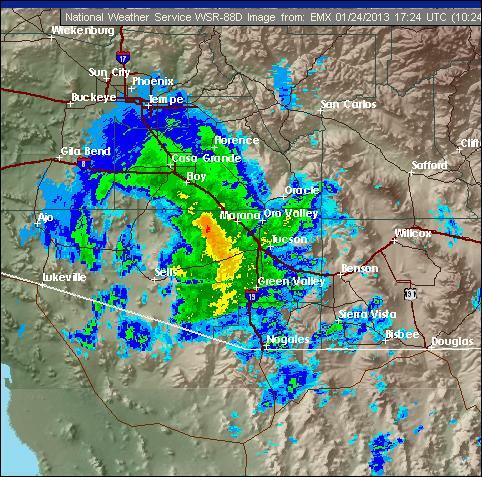 Eventually they will consolidate into a single system that will move across Arizona this weekend. The long plumes of moisture from the south are quite impressive. Below is the CIMSS blended PW product from 11 UTC - the plume of northward moving tropical and subtropical moisture is very impressive. Not an atmospheric river situation but a very broad moisture intrusion. 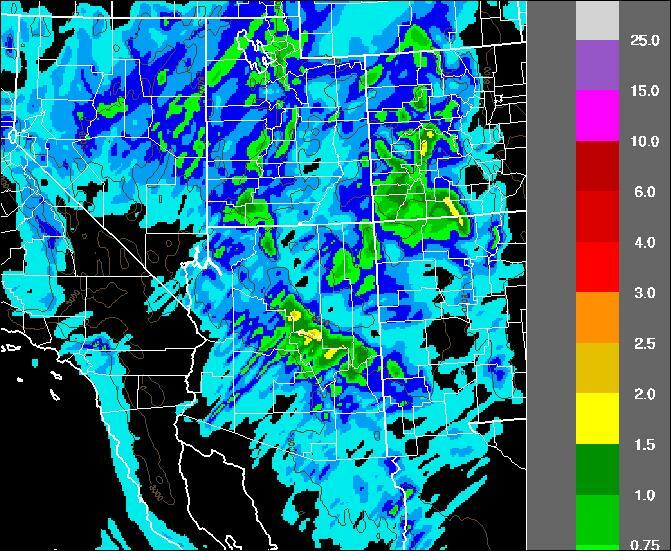 Below is the early GFS-WRF forecast of total precipitation through midnight Saturday night - model is forecasting some substantial amounts, especially across the Rim country. Will be keeping a close eye on the evolution of the model forecasts for this event. The 12 UTC 500 mb chart from NCAR RAL (above) indicates that the moisture plume from the south is inching toward the Southwest this morning. The chart also shows that the 500 mb anticyclone has moved eastward and is now centered between Tucson and Albuquerque (ignore the poor height contours over the Southwest).. The system of interest for the rest of the week is west of Baja. The water vapor image below indicates that the upper-level cyclone is west of southern Baja. Upper-level cloudiness is spreading slowly across Arizona this morning, so the perfect Chamber of Commerce weather of the last few days is giving way to periods of Pacific cloudiness and then eventually to showers. This morning's early run of the WRF-GFS forecasts widespread, but light precipitation, by midnight Friday night. Forecast above is of accumulated precipitation through midnight 25 January 2013. Tomorrow's WRF forecasts will cover the entire precipitation event and may reflect better the role of the low-latitude moisture plume. First - the string of freezing or below morning lows here at house ended yesterday when the low was only 35F. The freezing string was ten days - not at all a record for here at house. This morning very cold air covers the north-central and much of the eastern U.S. - above is 850 mb 12z analysis this morning from NCAR RAL. Coldest 850 temperature in U.S. is -27C at Green Bay, Wisconsin. Out in the West, a strong, cold high pressure area covers the Great Basin Region. The 850 mb temperature of -12C at Salt Lake is helping keep stagnant surface air trapped below an inversion, so that air pollution has reached to very unhealthy levels (see Steenburgh's blog about the Salt lake City "Ick"). Out in the Pacific this morning, the 1200 UTC water vapor image (above) shows a very large plume of upper and middle level moisture extending from south of 10N all the way north to Alaska. The next two 500 mb short waves that will affect the Southwest appear to have a much better chance of picking up more moisture than did the last two systems. 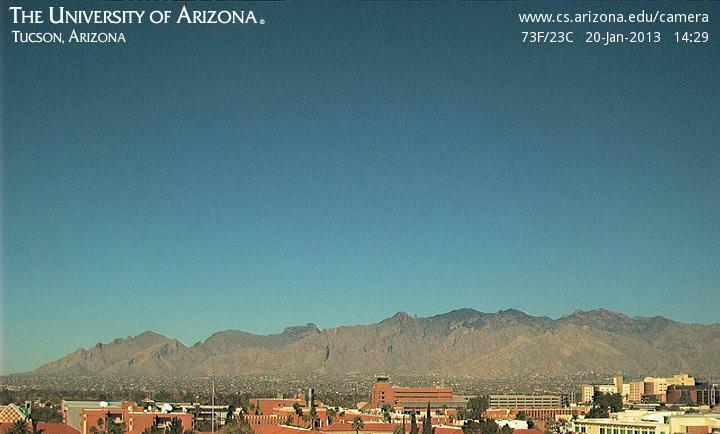 So, some changes happening that may bring a return of weather to southeast Arizona. The composite PW product from CIMSS at Univ. of Wisconsin (above) indicates substantial low-level moisture extending north to the east of the low-latitude upper-low that is centered north of 20N at about 135W. This will be the first system that will affect the Southwest toward the end of the work week. This morning's early run of Atmo's WRF-GFS model already shows nearby radar echoes by 5 pm MST on Thursday afternoon (above), The echoes forecast at that time are weak and would be producing only virga and light sprinkles. However, activity should increase Thursday night into Friday. 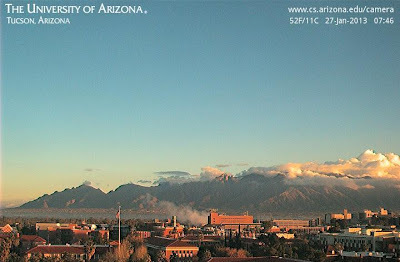 It is a beautiful, Chamber of Commerce, afternoon in Tucson today - Sunday 20 January 2013 -as above photo of Catalinas shows. Low temperatures here were 29F yesterday and 31F today - which puts the cold stretch with lows of freezing and below at 10 days. Diurnal range here at house yesterday was about 46F. Last week, I promised to give you the details on how we fared in the freeze, so here goes. On Sunday morning [the 13th of January], we reached a record-breaking 4F at the farm. And on Monday morning [the 14th], we were appalled when we looked at the thermometer, only to find that it read a big, indisputable 2F. 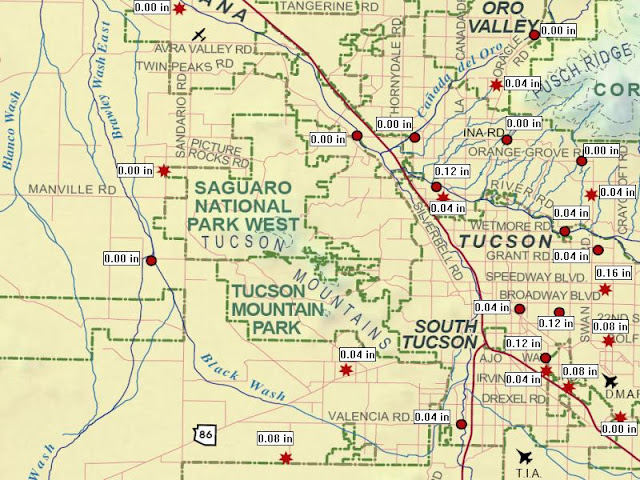 There is a nice NWS recap online of the cold temperatures at the airport, and other southeast Arizona locations, during the six day run of freezing temperatures at TUS. A cold wave, with record setting cold temperatures, enveloped southeast Arizona from January 11th through the 16th. 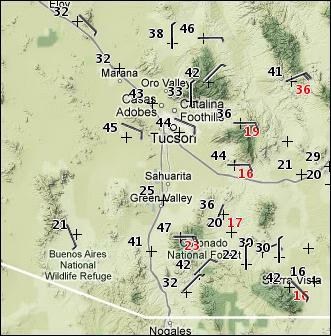 Below is a listing of the daily highs and lows that were recorded by select locations across southeast Arizona. Many locations either tied or broke daily records with a few sites tieing or setting all-time record January low. 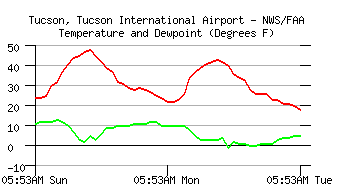 Since the airport is one of the warmest locations in the Tucson area, the length of the period of cold morning lows is considerably longer at other spots. 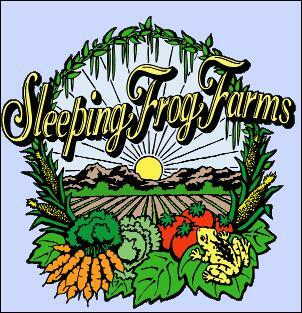 Back on October 25th some farms in the lower San Pedro Valley reported their first killing frost. Here at the house, within the City of Tucson, our current spell of freezing and below morning lows began on December 27th, and there have only been three days since then with lows above freezing. This morning the low here was 31F - making the current run of below freezing mornings eight days. Imagine that the January gas bill will be quite high. Another morning with large spread in temperatures across the local region - above MesoWest plot from about 7 am. 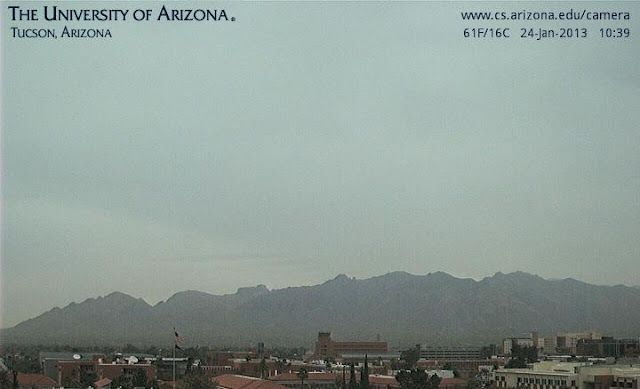 The airport has had windy conditions since midnight and reported a temperature of 46F at 7 am MST. Considerably warmer than forecast; however the WRF-GFS (see previous post) was quit good in catching the magnitude of the warming last night/early am today. Here at the house the temperature at 7 am was 25F - 21F colder than at the airport. Plot above has over 30F spread, with warmest temperature reported from Mt. Hopkins at high elevation. Low temperature here at house was 18F this morning - five straight days with lows from 14 to 20F. The above is a photo of some of the cactus damage on our circle. The large prickly pears have been hit pretty hard. Below is photo from Ron Holle of ice in a bucket out in his back yard (in Oro Valley) yesterday afternoon. Bucket was mostly in the shade and had a layer of ice more than an inch thick. My eyes may be playing tricks on me, but it looks like an endangered, rare species of fish is frozen solid in that chunk of ice. The WRF-GFS forecast from 5 am MST this morning does not predict winds as strong from the east as it did yesterday. The forecast (above - valid at 7 am tomorrow morning) continues to warm the low temperature, and it looks like another morning that will have temperatures all over the place - depending upon the local-scale winds. Mornings such as forecast for Thursday (above) and Friday (not shown) sometimes have very large differences in the minimum temperature here versus the airport. At 6 am this morning (16 January 2013) temperatures around the area are all over the place. The above surface plot is from MesoWest (Univ. of Utah) - temperatures are in black and wind gusts are in red. East to northeast winds are setting up at higher elevations, while some low-elevation spots are calm and cold.. Temperature at 6 am ranges from 13 to 36F - warmest area seems to be from east metro up toward Casa Adobes. 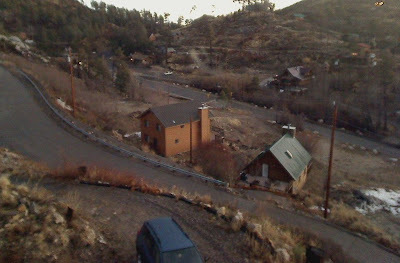 However, the Rincon Wash is in that region and here at the house the 6 am temperature was 20F. 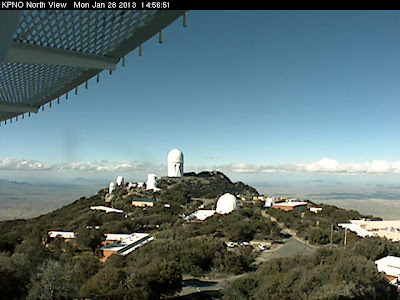 The high elevation RAWS stations are now warmer than the calm, low-elevation spots. What will tomorrow bring? Will check the WRF-GFS later (note the model forecast was too warm this morning for TUS). This morning's runs of the WRF-GFS model at Atmo forecast substantial temperature changes tonight through Thursday morning for the Tucson metro area. The rapid changes are due to east winds beginning tonight and becoming quite strong by Thursday morning (17 January). The above surface plot forecast is valid at 7 am on Thursday morning and indicates some temperatures holding in the 50s at sunrise. The WRF is warmer than the NWS forecasts for TUS the next two mornings (by about 7F or so). So, something to watch - I will certainly welcome the return to warmer temperatures. 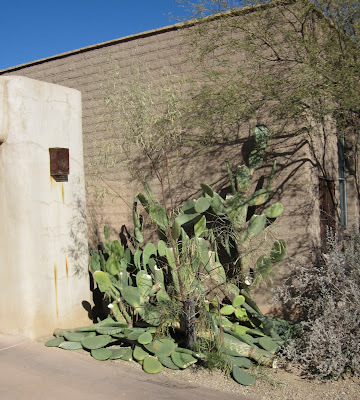 I don't look forward to cleaning up all the cactus limbs that have frozen and fallen off the large prickly pears in the yard. 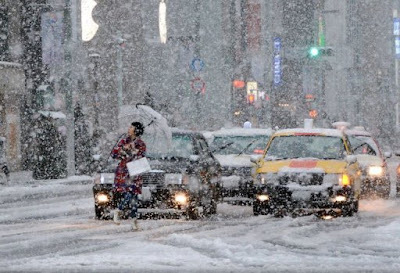 Very intense cyclone developed over southern Japan on the 14th and brought heavy snows to Tokyo yesterday - see photos below. The storm has deepend to about 936 mb this afternoon. The water vapor image above is from 1430 UTC this morning. Photos from a link on the SUNY MAP list. Fourth morning here with cold am low temperatures. Low yesterday at house was 17F again - same as Sunday. 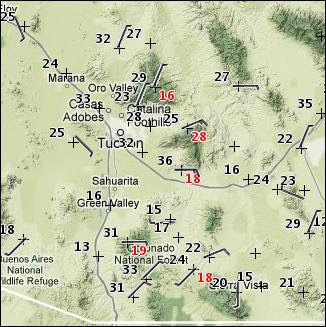 Yesterday the gusty winds during the afternoon seemed quite brutal (at least for down here in the desert). The anemometer trace from the roof of the Atmo building gives a feel for the wind - some gusts there above 45 mph, but airport only had gusts around 20 mph (here at house winds were probably around 30 mph for a couple of hours). 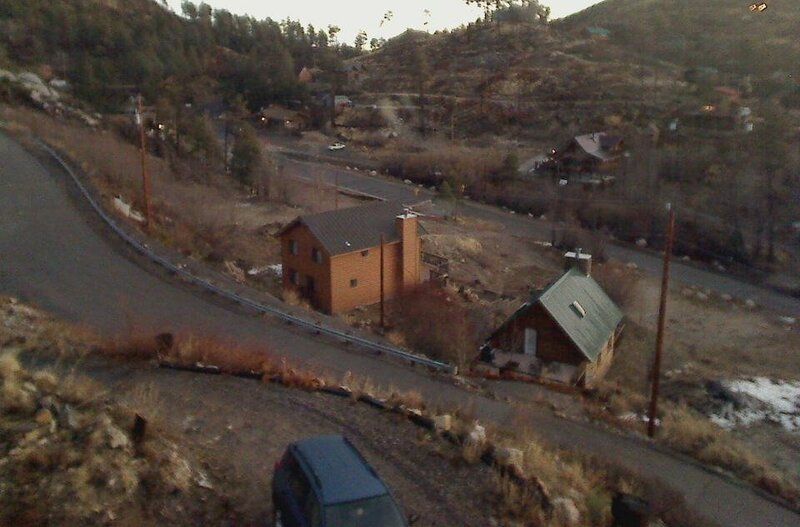 Temperatures very cold at 6 am this morning: Atmo 22F; DM 20F, TUS 18F and here at house 15F. The low will occur in about 60 to 90 minutes. Considerable plant and cactus damage already in this part of town and probably more today. More on cold in the West at Jim Steenburgh's blog - link to right. Edited to add: Low temperature here this morning ended up at 14F. Second morning of cold temperatures across the Southwest. Plot above is from observations between 6 and and 7 am this morning (Sunday 13 January). Here at the house the low was 17F (compared to 20F yesterday). The airport and DM both had lows of 24F. 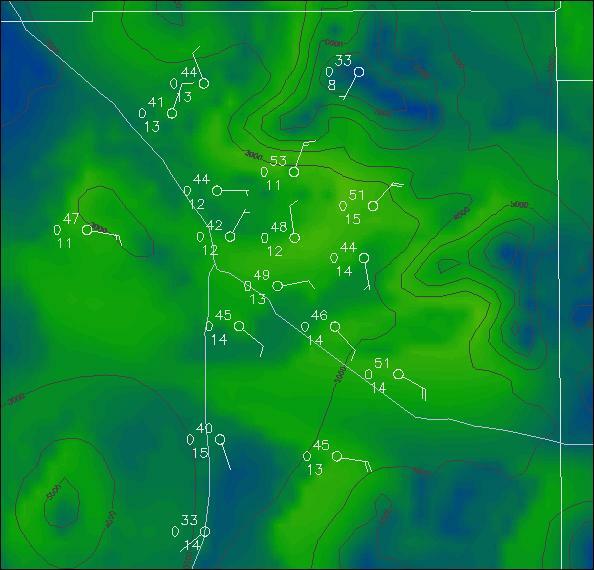 Checking around southeast Arizona I found a number of lows in the teens and colder. Coldest I found was -11F at the Columbine RAWS on Mt. Graham. The Rincon RAWS had a low of 6F, and the RAWS on Mt. Lemmon had 9F, while Empire and Rucker had lows of 10F.